Like the rest of the world, I was shocked to hear the news about Anthony Bourdain this morning. 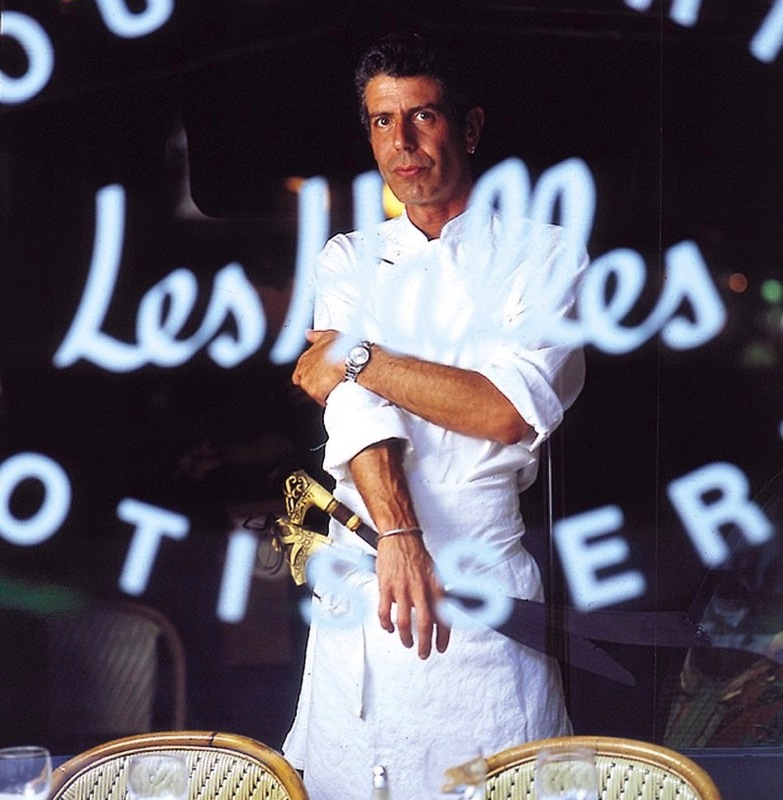 He first came into my life in the 90s when Andy’s urbane older brother took us to Les Halles, Bourdain’s Park Avenue bistro that made me feel like such a cosmopolitan. A few years later, I read “Don’t Eat Before Reading This,” the behind-the-scenes-at-Les-Halles essay that would become his seminal Kitchen Confidential and it blew my mind. Not only because I learned never to order fish on Mondays, but because it was the first time I realized that food writing could be about so much more than food…and, also, that food was about so much more than eating. On TV, it was his entree into other worlds and cultures — connecting people, nurturing people, understanding them, giving them a voice — and I think I speak for everyone when I say that it was an honor to be along for the ride all those years. For those of you who want to pay tribute to a life well-lived, listen to his interview last year on the WTF podcast. Lastly, this quote from Kitchen Confidential: “For a moment, or a second, the pinched expressions of the cynical, world-weary, throat-cutting, miserable bastards we’ve all had to become disappears, when we’re confronted with something as simple as a plate of food.” What a loss. RIP. The 17 Best Books to Read this Summer (by trusted DALS contrib, Elisabeth Egan) I’ve already read and loved this and this. This green sauce is so up my alley. My plan is to make a jar this weekend and drizzle it on everything that comes off the grill, including vegetables. Speaking of which, I’ve posted this before, but I’ll post it again because there’s been so much renewed interest on my instagram feed. This is the indispensable vegetable basket I use for the grill, and I’m not sure how I got along without it for three decades. A strawberry icebox cake that is such a great idea for right exactly now. Obama’s last days in office, by his Deputy National Security Adviser, Ben Rhodes. Resolved: I’m putting everything on a bed of ricotta this summer. Locals! Check out this awesome day of wellness and deliciousness, brought to you by the talented folks at Bon Appetit’s Healthyish. My Nate Appleman obsession continues with his roasted chicken meatballs. I find this story fascinating — not only because it’s about a teenage cross-country runner (who we’ve been lucky enough to watch at Phoebe’s local meets) but because it makes you realize how hard it must be to raise a prodigy…and be a prodigy. I love this whole line for outdoor dining — and especially these Bambino cups that double as bud vases. Get to Walrus at 4 pm on Sunday…there may be people already waiting since it’s summer but you should be able to waltz right in. Bonus: happy hour (half price oysters). In addition to slurping oysters, don’t miss the beef tartare. It’s heaven on a plate. Since you’re a doughnut fan, make a rez to get in the Amazon Spheres on a Sat (only day open to the public) and try out General Porpoise while you’re there. (Renee Erickson owns both eateries already mentioned!) Molly Moon for ice-cream unless you’re curious to try vegan ice-cream and then Frankie and Jo’s is a must. If you love Benedicts get to Fat Hen at 8 am when it opens or for a late brunch (1ish). Rosselini Bakery across the street has wonderful macarons and probably the best baguette (weekends only) in the city if you need some snacks for later. We are a city of parks and water so by all means get your walk on or get in a boat. The Book Larder sells only cookbooks so stopping by to sign yours would be a treat for us all. This is my street! Yes to fat hen, followed by Roselinnis, and then Frankie and Jo’s is next door for vegan ice cream. And agree re: W+C- get there a bit before 4 and you’ll be fine. Apologies for the rainy weekend- though I guess you are getting the real Seattle experience. General Porpoise is amazing, but they have more than that one Amazon location. The one in Capitol Hill will do. I also love Top Pot Doughnuts and all the Tom Douglas joints (like Serious Pie and Dahlia Lounge.) As others have mentioned, Molly Moon is the best. Oh and if you like architecture, check out the main branch of the public library. They have maps for self-guided tours. It’s impressive. Seattle! Fish and chips at Ivars, then a ferry boat ride if you have a sunny day. Walk up to Pikes Place Market and buy a big bag of cherries and some flowers. Get lunch at Salumi Salami or just bring some salami home. Pick up sushi at Uwajimaya and picnic at Discovery Park. Hang out at Elliot Bay books. Get some ice cream at Molly Moons. Get your coffee at Caffe Vita on Pike. Go back to Elliot Bay to browse some more. Visit the wooden boat center on Lake Union. Check out the Museum of Flight if it is a rainy day. Buy something at REI. That’s how I would spend a long weekend in Seattle! So glad you posted the link to the Abby commencement speech. I might have missed it and it was definitely not one to be missed. Have my daughter watching it now bc I knew she would never make it all the way through the read:(! It was a few years ago, but when I did the Walrus and Carpenter we just showed up right around when they opened, gave them our name, walked around a bit (there are some cute stores right up the street), hung out at Barnacle bar next door for the last bit and it wasn’t the worlds longest wait. So I guess my tip is to maybe shoot for dinner earlier than 7? Plus, Barnacle Bar is awesome and if/when I return to The Walrus I would definitely return to Barnacle as part of the night as well. We always try to do three things when we are in Seattle: eat at Serious Pie (https://www.seriouspieseattle.com), have breakfast at Lowell’s in Pike Place Market, and visit Elliot Bay Books. Check out at least one of Linda Dershcang’s places. http://www.thederschanggroup.com/ My favorites are Smith’s, Tallulah’s, and Oddfellows. If you go to Oddfellows then you have Elliot Bay Books next door and Molly Moon’s around the corner. Get a cocktail at Essex and then have wood-fired pizza next door at Delancey’s. I’m feeling like you already know about these places owned by Molly Wizenberg (Orangette) and Brandon Petit. Yes? The Seattle waterfront and Pike Place Market are definitely musts, especially now that the new MarketFront is complete. If you want a stellar view of the Seattle, go to Kerry Park on Queen Anne (one of the many hilly neighborhoods). It’s even better if you go there at sunset. So many great neighborhoods and restaurants–it will be hard to choose! Enjoy your time in the city! – Use mass transit as much as you can (don’t even bother trying to drive in downtown – trust me). – Uwajimaya and the International District is a lot of fun (ever see a 15lb jar of kimchi?) . – The Chihuly glass exhibit is awesome (go in the evening and you can save some money and it’s a super small exhibit so you don’t need a ton of time to go through it). – Kerry Park in Lower Queen has a gorgeous view (it was the view in 10 Things I Hate About You). – If it stops raining a bit than definitely hit up Discovery Park or Golden Gardens. – Elleno’s Greek Yogurt is yummy and there is a stall in Pike Place Market. – Ballard Farmer’s Market is fun (so is the Fremont one). In Seattle, go to the Columbia Tower for THE BEST views of the city (it’s much less expensive than the space needle + it dwarfs the SN, and there are no lines). And, even though it’s a bit touristy, the underground tour is really interesting and something a teen likes (I know from experience!). Get big old artichokes from Pike’s Place and eat really good Puget Sound/Hood Canal oysters. Do not miss Sea Wolf, the lye rolls are out of this world! +1 for Chihuly Garden, even my kindergartener was enthralled by it. We had an amazing meal at Local 360 in Belltown (mmmm Deviled Eggs topped with Dungeness Crab). Madison Park is our favorite Seattle neighborhood. Not far from the city center, but a beautiful and relaxing hamlet to explore. Cactus has yummy mexican food and delicious margaritas. Seattle! You must go to Beth’s Cafe. And to the Archie McPhee store. Have fun in Seattle! I always vote for Delancey (you can have a drink or snack next door at Essex while you wait – they have a small area where minors can sit). While you’re in Ballard, there are fun shops, fun views of the ship yard, and you’ll be near Frankie & Joe’s for incredible vegan ice cream. Golden Gardens is on that side of town as well! It’s also fun to take the water taxi across to West Seattle, to eat at Marination (Korean-Hawaiian fusion) while taking in the Seattle skyline across the bay). Then you can walk along Alki Point, or drive around to Lincoln Park for views of Vashon Island. Another thing I enjoy is walking through the sculpture garden back on the Seattle waterfront, perusing Pikes Place Market, and having drinks at The Edgewater. And, if you have time… go north to Bellingham! Get off I-5 early and take Chuckanut Drivefor incredible views of the San Juans and Skagit Farmland. So many good suggestions! I’m not a huge fan of Molly Moon’s but Fainting Goat Gelato in Wallingford is amazing. Have fun! My absolute favorite, favorite bakery ever is Cafe Besalu in Ballard. Amazing danish with fresh, seasonal fruit. Seattle! We are excited to have you!!!! Don’t miss Ellenos yougurt (cart preferred- they serve like gelato!) but store bought won’t disappoint. We have A few DTF outposts here if you’ve not had the chance elsewhere for dumpling heaven. I am on the board for Pike Place Market Foundation, a nonprofit to support social services in the Market. Happy to provide Market info, connections, etc. Hope you enjoy our wonderful city!!! I can’t believe how sad I am about his passing too. I have been watching my favorite Parts Unknown episodes this weekend. What a loss. My daughter and I are heading to Seattle in a few weeks too! We plan to hit Elliot Bay Books, the ferris wheel thing, the arboretum, the Ballard Locks, a ferry ride, fish and chips at Ivars, another ferry ride…And I do want to go to Delancey. I dread the traffic there though, it’s just awful. And this is coming from a New Yorker! You must have a grilled crab and Swiss on sourdough from Burgermaster—and a milkshake. + 10 for il Corvo – I also agree with the person who said to go to the Walrus and the Carpenter early, we did this on a Sunday and got right in (and also enjoyed happy hour!). WOW, you guys are amazing. Great Seattle suggestions! I’m so excited. Check back for updates on the itinerary if you’re not following me on instagram. THANK YOU EVERYONE! -Westward in South Lake union if the weather is good. – If the weather is good, take the water taxi to West Seattle and have snack/drink at Marination Makai! -if the weather is bad, Delancey and Frelard Pizza are so good, as is Drunkys Barbeque in Frelard or Tamarind Tree for the most amazing yummy (and paleo friendly!) Vietnamese food in the International District. Or, go to Uwajimaya in the I district and eat next door at boiling point if it is cold and rainy. -London Plane in Pioneer Square is also so fun and instagram worthy! Seattle is a great foodie town! Regarding the Remodelista Considered Design Awards, I entered our master bath in the Amateur Bath category – it’s the Skyhawk Master Bath Remodel. Weeeee!!!!! Only thing missing from the Seattle suggestions is to visit Sosio’s at the market and have them select peaches ripe that day. Pick up some De Laurenti prosciutto and a baguette and head over to the Seattle Art Museum Sculpture Garden for an impromptu picnic with a view of art and the Sound. Another idea since you have a teen with you is to visit the UW campus and be sure to go into Suzallo Library (Hogwarts). Also, if Abby is the Palio gal, when you’re in the U area, go to Great State Burger as they will happily wrap your burger in lettuce vs. a bun!